Welcome to my Scraproom! This is my creative space, the room where I create and spend most of my time.I am lucky to have a big room – we chose that house just for this room ! =) Let me take you on a tour! Here’s my December Daily spot. I know I know, I haven’t finished it yet but I plan on working on it as soon as I am back from CHA. I glued some Project Life and Letterpress cards on my furniture, along with some business cards and illustrations that I liked. This is where I have most of my Project Life stuff – the famous Raskog basket ! It contains baskets with stamps, PL cards, tags, stickers, and other embellishments. 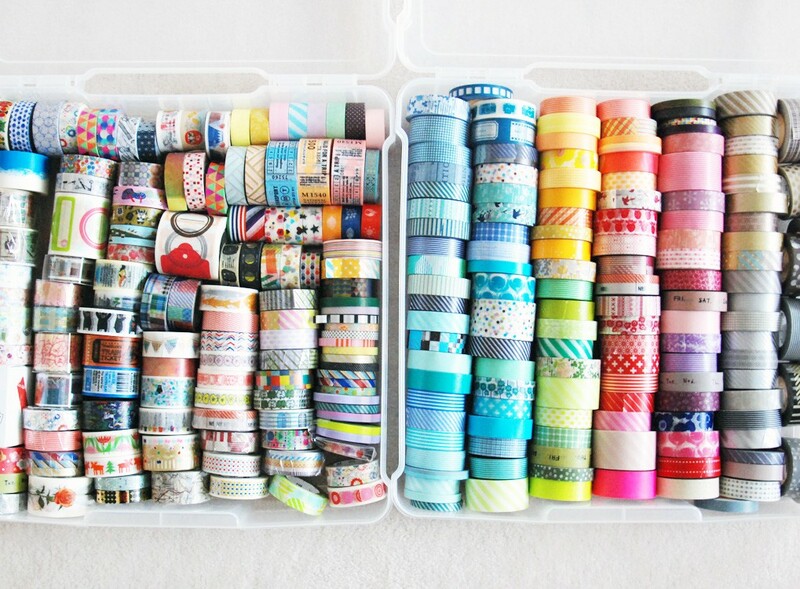 I store all of my washi tapes in an Ikea bin (how lucky to have an Ikea 15 mns drive !) – it’s easy to store and grab. Here’s where I have my Letterpress machine and plates. Just for fun – here’s my desk in the middle of a creative storm ! J MESS ! Here comes my Project Life station! I have this tall shelf that my dad made me on which I have all of my PL items ready to be used. Don’t freak out – here’s all my Sizzix dies ! J Yes, I LOVE LOVE LOVE my Big Shot! My dad (aka MacGyver) built me this paper rack. I placed my Big Shot on top so it’s easy to use here. I’ve got another shelf here with most of my wooden stamps (yes, I’ve got lots) and also disaply photos and artwork. I LOVE BOOKS, can you tell? Books and Mini Books are displayed here and I love going through the pages on Sunday afternoons, with a coffee. I have this old tape display that I recycle here to store my inks – perfect size ! And you can see a picture of my beloved sister. Well, I hope you enjoyed this tour in my Craft room! Thanks for sharing Celine! I can feel the creative energy in that room!! 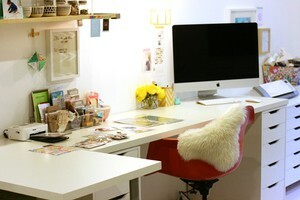 I've always loved your work space! Love this! Thanks for sharing your space Celine, and for sharing a photo of your sister. Wonderful space, thank you for sharing. It's so fun to see all your creative goodies! Thank you for sharing. I am cleaning out my stash, but I don't have as much as you :)....So glad you have such a great room to fill! Your space is so amazing, I'm very jealous! Oh your space is amazing! Loved the tour and see so many goodies that I'd like to play with! 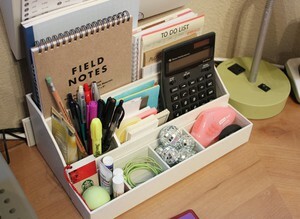 I see lots of IKEA storage items too as I have many as well. I love that you call your dad aka MacGyver. Too funny... I call my husband that too, because he loves and is challenged to make, fix or find a way to do anything. Haha. Cheers Celine! Wow, I'm a bit jealous, what a gorgeous big room, love it. I totally need a McGyver of my own. Great space ! Wow! You've totally inspired me to create a heap of mini books! Wow! Awesome idea w/the cake pans! Need to tell the hubby this idea! Gotta love Ikea! We live real close to one too! Love my Expedit book cases! Your mini books look so amazingly cute in those little cubbies. I also love my Expedit, but our Ikea is on the other side of the state, so we have to bribe/impose upon friends and coworkers traveling back and forth. Anyway, thanks for the wonderful tour of your space! All those books look AMAZING as does your workspace!! Love the MacGyver paper rack! Love the paper rack! Can't seem to find 12x12 stackable paper trays in Europe. Must get my dad to build me one too! That is a spectacular craft room! I think every part is my favorite! What a cool room! Full of supplies, just like I love it! ;) I was wondering, though, what kind of letterpress machine you use? I am thinking of getting one, but have no idea where to start!